ETS provides a friendly, close-knit working environment and values supporting each another working towards common goals and objectives. We allow (nay, insist) that each individual works independently towards mutually agreed upon goals. Simply put, you have the latitude to perform your job with little management; employee input is expected. Job growth is your responsibility. We like new opinions and ideas, too! For a better picture, check the rest of our website. What's in it for you? An Innovative, pleasant work environment, and a supportive team plus salary, benefits and a piece of the action as appropriate. 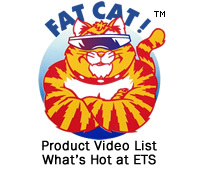 ETS is seeking energetic people to represent our product lines in the United States and Internationally. For more details about these opportunities to get in the door with our aggressive campaign, contact Trudy Andresen via email at for more details TODAY!